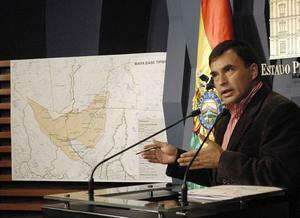 This week opened a new chapter in Bolivia’s TIPNIS conflict. A majority of community authorities in the Isiboro-Sécure Indigenous Territory and National Park announced plans for another national march beginning April 20 to protest the government-proposed highway that would bisect their ancestral homeland. They also pledged to resist the government-sponsored consulta (consultation process) on the road, scheduled to take place from May 10 to June 10, which they regard as illegitimate. Thus the stage is set for a new round of high-stakes confrontation. Meeting of TIPNIS community authorities. Credit: Erbol. The march was ratified unanimously by the 41 TIPNIS community leaders (out of 64 total) who attended a meeting sponsored by the TIPNIS Subcentral on March 17–19. Of those not present, eight are affiliated with CONISUR, a pro-road faction mostly representing communities in the southern portion of the park that are outside the indigenous territory. The remaining 15 are affiliated with Sécure Subcentral, which is divided on the issue and will decide its position by the end of the month. The meeting of community authorities took place in an atmosphere of considerable tension, with participants’ arrival delayed by the lack of available gasoline for boat travel (the primary means of transportation in many areas of the park). 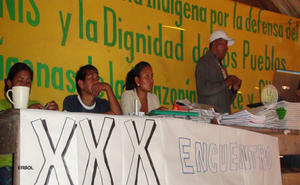 Attendees accused the government of establishing a “blockade” to undermine the meeting. Government officials attribute the shortages to new licensing requirements which are designed to curb sales for cocaine production, causing temporary disruption for many distributors. Participants also denounced what they perceive as the government’s campaign to “blackmail” communities into supporting the road in exchange for gifts and benefits, along with the growing “militarization” of the TIPNIS. 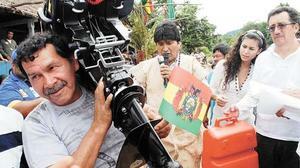 In recent weeks, government officials (including President Evo Morales) and navy personnel have delivered food, clothing, outboard motors, radios, and generators, along with promises of housing and cell phone antennas, especially to communities in the contested Sécure zone. Members of the armed forces have also been highly visible, distributing cash transfer entitlements to the elderly, school children, mothers, and pregnant women in remote TIPNIS villages. Morales delivers outboard motors. Credit: La Razón.From the government’s point of view, it is fulfilling promises made to long-neglected communities whose needs came to light during last December’s “counter-march” in favor of the TIPNIS road. It’s also typical for Bolivian military personnel to participate in such events, and a beefed-up military presence coinciding with the visits of high-level officials is hardly surprising. Still, under the circumstances, these activities have contributed to a heightened level of tension. Participants also accused the government of “criminalizing” the TIPNIS protest movement, by pursuing charges against 26 indigenous leaders and their allies in conjunction with the alleged kidnapping of Foreign Minister David Choquehuanca during last September’s march. This past week, Chief of Staff Juan Ramón Quintana denounced 11 TIPNIS leaders for allegedly diverting more than $1 million in government funds targeted for community projects. Anti-road sectors view the accusations as yet another attempt to discredit the protest movement and undermine indigenous efforts for sustainable local development in the “untouchable” (for now) TIPNIS zone. Ironically, the government has recently promulgated (without fanfare) the long-awaited regulation defining the zone’s “untouchable” character, which was negotiated last December with lowland indigenous leaders before becoming derailed by the pro-road counter-march and the subsequent law mandating the consulta. The regulation recognizes the exclusive rights of indigenous TIPNIS groups to utilize and sustainably manage the natural resources within their territory, for traditional, but not commercial, purposes. A technical standard to define alllowable activities within the park must be developed within 60 days. Under the circumstances, this is bound to engender further controversy. To a degree, the escalating TIPNIS conflict seems to have developed its own internal logic of tragic inevitability. As Página Siete columnist Ilya Fortún observes, the government’s recent offensive may have left road opponents with few strategic options other than to launch a new march, timed to expose the illegitimacy of a consulta that will take place in the absence of its intended constituency. Yet, he notes, the expectations for what a march simultaneous with the consulta can achieve may be unrealistic, in a political climate that has changed markedly since last October. With the new political team under hard-liner Quintana’s control, Fortún argues, the government has regained the Quintana denounces TIPNIS community leaders. Credit: La Razón. upper hand. It will continue to plant seeds of doubt about the legitimacy of existing TIPNIS leaders and their proposed resistance tactics, which will be reinforced by counter-marches defending the consulta. As May 1 approaches, Fortún predicts that the government will have increasing opportunities to sway constituencies with promises of economic rewards and benefits that are traditionally delivered on that date. And with Quintana at the helm, the protestors cannot count on the government to make strategic mistakes, as it has in the past, or on a repetition of last September’s violent police intervention to mobilize massive popular support. Still, there are forces that persist in seeking a reconciliation. The UN Human Rights Commission has announced that it will not participate in the consulta unless all parties have agreed to support it, avoiding the need for a national march. Anthropologist Xavier Albó argues that the government should take advantage of pending constitutional challenges to the consulta law to extend its mandatory timetable and delay the process, in order to create space for dialogue. Today, for the first time, Morales opened the possibility of a debate over alternative highway routes connecting the Beni and Cochabamba departments, and stated that the consulta should define the optimal route. As TIPNIS leaders reiterated at last week’s meeting, they will not oppose constructing the road outside the indigenous territory. It’s not yet clear if Morales will consider options that meet this criterion. Stay tuned.